As the wife of a class of 1989 alumnus, the mother of 2015 and 2018 alumni, and the teacher of many graduates, I am completely vested in helping establish and maintain long-term relations with and among alumni, parents and friends. I encourage graduates as well as faculty, staff and parents to maintain an ongoing relationship with Saint John’s School and to support the community in developing connections and networks that extend well beyond the walls of the school. Please join the Alumni Facebook group to stay connected with the ongoing events and news throughout the year. 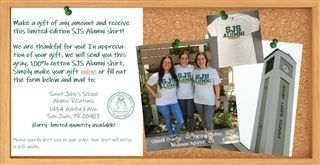 Receive an Alumni Shirt with any Gift!